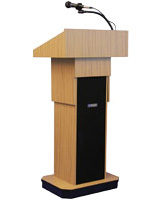 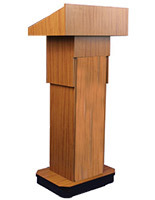 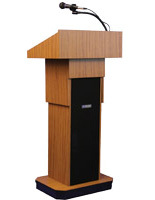 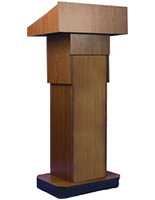 These oak podiums with sound system feature an adjustable height that ranges between 39" and 45" tall. 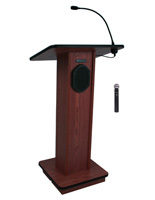 The speaker's stands are great for any presentation because they come with (2) microphones, one wired and the other, a wireless lapel model. 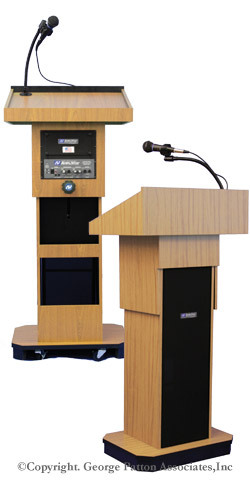 The adjustable height oak podiums are also highly portable with their (4) hidden caster wheels, (2) of which can lock to remain stable. 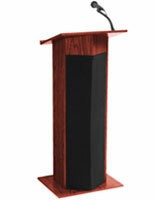 In addition, the speaker's stands with included microphones are made of sturdy wood with light finish that blends into any environment. 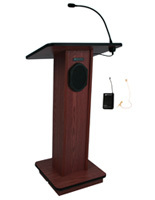 The podiums include built-in speakers and a 50-watt amplifier, making them ideal for a presentation to a crowd of 1,000 or to a 10,000 square foot room.